Gardeners eagerly searching for early spring growth often find peony shoots sprouting from the ground. Peonies are an ideal addition to any yard or garden due to their longevity, ease of growing and delightful fragrance. Choose from a variety of different sizes and colors and then find a sunny spot where the blooms will provide striking beauty and a lovely scent in mid to late spring. Select a growing location that receives at least six hours of sunlight every day. Do not place a peony plant near trees because the roots of a tree will take water and nutrients away from the peony. Work the soil in the autumn to prepare for planting the peony bulbs. Add compost to the top of the soil and work it into the soil down to a depth of approximately 12 inches. Dig holes approximately 18 inches deep and wide enough that the roots of the bulbs can spread out to the sides in the holes. Fill the bottom 10 inches of the holes with loose loam soil to give the roots a fertile soil to grow into. Space the holes between 3 and 4 feet apart. Place the bulbs into the prepared holes so that the eye buds face up. Cover the bulbs with approximately 2 inches of soil. Replace the soil around the bulbs carefully and water the newly planted bulbs generously. Place approximately 2 inches of mulch over the bulbs for the winter and remove the mulch when spring arrives. 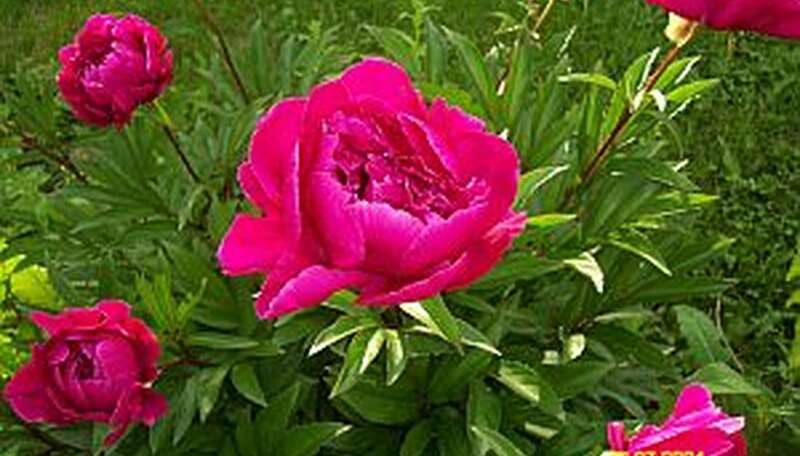 Do not use more mulch than this because if the bulbs are kept too warm, the peony may not bloom.